If you want an improved garage, you can rely on Custom Garage Works! Back in 2003, we started out by providing top quality garage floor coating in Cleburne,TX. We wanted to craft the ultimate garage, and when we could not find what we needed in the industry, we made the decision to create it ourselves. Presently speaking, we are proud to provide our clients with some of the best garage storage solutions on the market, along with floor coatings that are stronger and longer-lasting than traditional epoxy. We are passionate about fantastic garages, and while we started with a simple garage floor coating service, we are proud to provide many additional custom garage solutions to the DFW area. 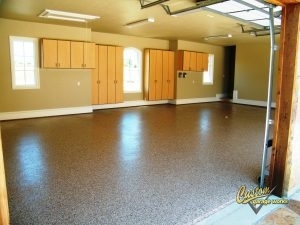 One of our most popular garage options is our garage floor coating in Cleburne, TX. This is because by using polyaspartic coatings in lieu of epoxy, we create a finish that lasts longer and is more durable. While epoxy coatings start to peel and turn yellow within a short amount of time, our polyurea based garage floor coating does not. Since we choose to use a diamond grinder to prep the floor for coating, as opposed to acid etching, we can provide a higher quality end result. If you’re interested in hearing more about our garage floor coating service, please schedule your free estimate when you call 214-494-9068 or 817-308-1305. Garage Floor Grinding By using diamond grinding instead of acid etching, we can ensure a stronger, more durable coating that will last for years. When you choose a storage solution from Custom Garage Works, you never have to shuffle through piles of clutter in your garage again. 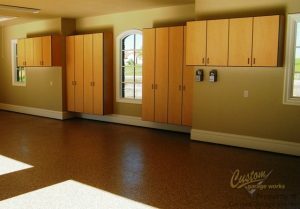 We know that a brand new garage floor looks best when it isn’t covered by other items in your garage. We provide a selection of solutions to organize your belongings, including overhead storage racks and garage cabinets. We provide some of the most durable overhead storage racks in the industry, and our storage cabinets are specifically designed for garage needs. We are committed to helping our clients get the perfect garage floor coating and organization for their requirements and budget, and we look forward to assisting you! Overhead Storage Racks If you need to get more from your overhead storage space, our storage racks provide resilient and reliable storage. Storage Cabinets Unlike kitchen cabinets, these are designed specifically to let you get more from your garage space! And More! Do not be concerned by clutter in your garage any more. We have the organization products you need!